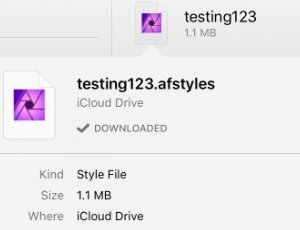 If you mean the screenshot, it does not matter how the file is badged (with the Designer or Photo logo), as long as it has the extension .afstyles & in Files the info popup says its kind is "Style File" it should work & be importable into either Affinity iPad app. 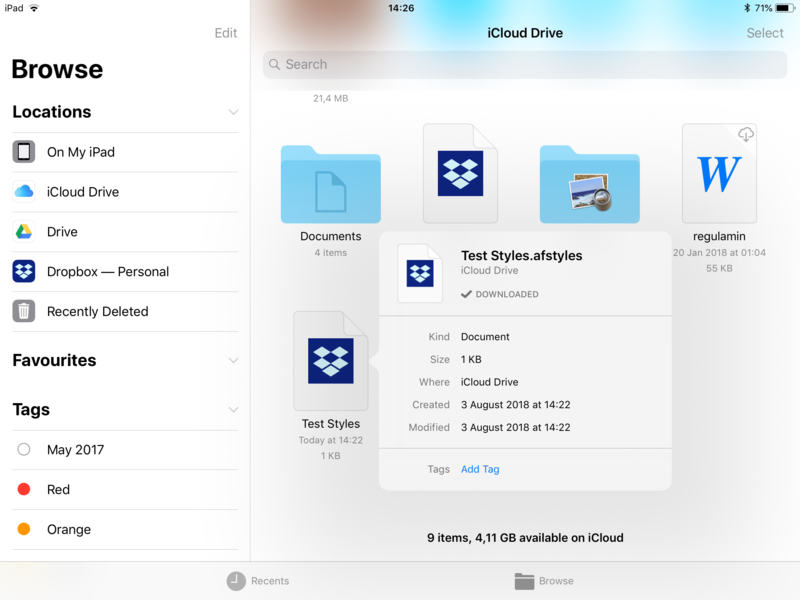 So maybe try this: download this Test Styles.afstyles file to some iCloud Drive (not Google Drive!) folder directly (see below) onto your iPad. In Files (not Designer) go to that folder & long press on it, choose "Info" & see if that shows the afstyles extension & "kind: Style File." It will probably have the Affinity Photo badge, but that does not matter. The file just contains two useless styles I created on my iPad for this test, so just see if you can get it to show this same info on your iPad in Files. If it does, you can try importing it into Affinity Designer if you want. Otherwise, we need to try something else. Note: to download the file directly onto your iPad, one way is to view this page in Safari on your iPad, tap the filename above, & use the Share icon to save it to one of of your iCloud Drive folders. It would probably also work if you saved it to an 'on my iPad' folder but I did not test for that. I just tried from Designer, I created a few styles in a new category and exported them to my iCloud. I deleted the category from Designer (just in case) and was then able to import the category straight back into Designer from iCloud, so it’s not a general bug. FWIW it showed up as a Style file with a Photo icon, like from R C-R so I think that is just how the iPad sees styles files. There was no Photo in sight when I did it. Do you have Affinity Photo installed? If not there's a known issue that's preventing Affinity Designer to recognise .afstyle files. @MEB No I don’t have affinity photo. Maybe that’s why. however I was able to import and export all brushes. Brushes, assets files etc work fine. Only .afstyles files are affected. @MEB so what can I do? Is this issue going to be solved? Or this will stay for a life time? Yes, this will be fixed. It's already logged and is being looked by a developer. I'm sorry for the inconvenience this is causing you.